and most of all, slow. the job without any preconceived ideas. motion of the older cars. These cars actually accelerated faster than the automobiles of that day. the tracks, while the heating, ventilation, and braking were much improved over the old streetcars. as the P.C.C. The PCC style streetcar design would become the standard for the industry for the next few decades. produced in Europe through the remainder of the 20th century. follow, and somewhat sidetrack the conversion program plans—if only for a short period. refurbished, and then put back into service. excellently, considering their age and worn-out condition. 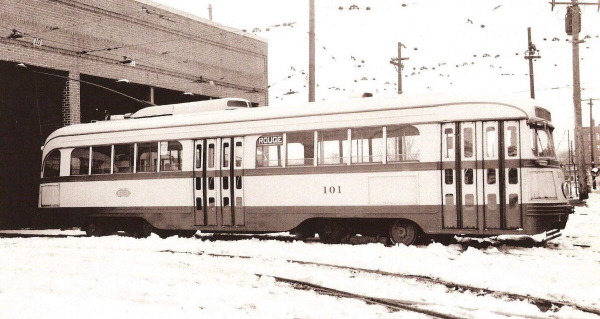 In August of 1945, the DSR—realizing that its existing rail fleet had worn out—ordered "two" PCC cars from the St.
still in their red and cream Pittsburgh colors, and were placed into service on the heavy Woodward Avenue line. various articles written by Jack E. Schramm on Detroit's Street Railways. were first tested on the DSR's heavy Woodward Avenue line before additional cars were ordered.